Over nine states are effected. In Minnesota: Separate bills have passed in the state House and Senate, but a final bill has not yet reached the governor’s desk, because of “nay” votes from legislators a recent editorial in the Grand Forks Herald called “privacy-minded Republicans” and “immigration-concerned Democrats.” REAL ID seems headed for approval, though, because without it, the editorial states, “Minnesotans will have to show passports every time they fly.” And that’s certainly more distressing than having your privacy rights violated. The headline in December 2016 read: “Come 2018, driver licenses from nine states won’t be accepted as IDs at the airport.” The countdown is on. Ten years ago, Privacy Rights Clearinghouse criticized the REAL ID Act of 2005, calling it a “de facto national identity card” that would “result in significant new fees and hassles for everyone who needs a license or ID,” create “national linked databases allowing millions of employees at all levels of government around the national to access personal data,” and increase the chances for identity theft. 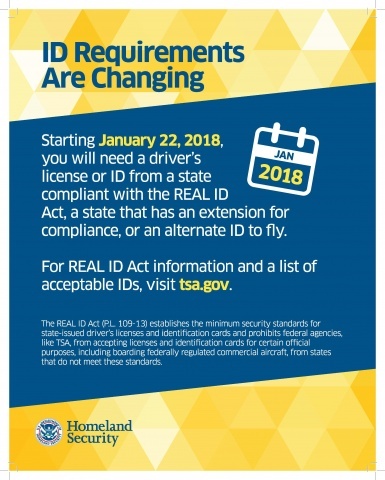 But REAL ID will keep terrorists out of the U.S., right? Well, the Department of Homeland Security says “REAL ID is a coordinated effort by the states and the federal government to improve the reliability and accuracy of state-issued identification documents, which should inhibit terrorists’ ability to evade detection by using fraudulent identification.” But the New York Civil Liberties Union says, “Identity-based security is not an effective way to stop terrorism. Driver’s licenses do not reveal evil intent, and REAL ID will force many who may have valuable intelligence information further into the shadows.” So, REAL ID threatens privacy, creates bureaucratic chaos, costs a fortune, and doesn’t do what it purports to do. More than nine states haven’t embraced REAL ID yet, and we can see why. Defending Rights and Dissent researched 10 states that have so far resisted REAL ID. Starting in January 2018, driver’s licenses issued by those states will not be accepted as identification at Transportation Security Administration checkpoints at airports. Here’s how the 10 states are reacting to that. South Carolina: The state House passed a bill in March that will allow residents to obtain driver’s licenses that meet REAL ID requirements. They can’t get them until October, though, and as of now, South Carolinians will be denied entry to military bases and other federal facilities after June 6. Interesting fact: South Carolina has 10 military installations. The cost to the South Carolina Department of Motor Vehicles to make REAL ID happen is estimated to be about $20 million between now and 2020. Kentucky: Gov. Matt Bevin got real about REAL ID this year and signed legislation to bring the state into compliance. Last year, he vetoed a similar bill. The state will get an extension, according to the bill’s sponsor, and Kentuckians will be able to opt out of getting the enhanced driver’s license, which requires that they show personal information and let the government scan it. Oregon: State Sen. Bill Hansell is proposing a solution similar to Kentucky’s. He said, “I sort of envision it like a vanity license plate. If you want it, you can get it. You pay more for it and it’s yours to use.” The new license would cost an additional $20 and create a two-tiered driver’s license system. Washington: With bills in the works, this state is also on the way to having a two-tiered driver’s license system. The state Senate recently passed an amendment that would lower the cost of an enhanced, REAL ID-compliant driver’s license from $108 to $66 for a five-year license. Minnesota: Separate bills have passed in the state House and Senate, but a final bill has not yet reached the governor’s desk, because of “nay” votes from legislators a recent editorial in the Grand Forks Herald called “privacy-minded Republicans” and “immigration-concerned Democrats.” REAL ID seems headed for approval, though, because without it, the editorial states, “Minnesotans will have to show passports every time they fly.” And that’s certainly more distressing than having your privacy rights violated. Missouri: In an article published in March, Ron Calzone — the director of Missouri First, which is a think tank that promotes personal liberty and constitutional governance — calls REAL ID a “Big Brother hybrid” and says “You would have to be a fool to think that what starts out as optional participation in REAL ID will not ultimately be mandatory for all, and once we capitulate there will be no turning back.” But there are identical bills in the House and Senate, and guess what? They allow for a two-tiered driver’s license system. Montana: The Montana Legislature forbade the implementation of the REAL ID Act in 2007. Since then, the state has been receiving extensions, but its most recent request for one was denied. The governor, the state attorney general and many Montana leaders are against REAL ID because of concerns about privacy. There’s an opt-out bill in the house Senate. Will state legislatures choose to defend residents’ privacy rights by rejecting REAL ID? Will they consider the cost to residents who will have to purchase passports or obtain enhanced driver’s licenses in order to travel by air or visit military bases? Will they seek to make everyone happy by passing opt-out REAL ID bills? And, perhaps most importantly, will a two-tiered driver’s license system be a way to protect the residents of the state or will it put the state one step closer to full implementation of REAL ID? And what about the Trump administration? In October 2016, The Daily Beast predicted Donald Trump would be in favor of a national ID card, since “If you want to round up and deport 11 million men, women and children who entered the United States illegally, then the rest of us have to have a way to prove we are legal.” But on March 28, 2017, Missouri Gov. Eric Greitens said he had spoken with Trump administration members who indicated that the president might be considering intervening in the implementation of the REAL ID Act, either by halting or delaying it. So we don’t know exactly how or when things are going to get really real, but we’ll keep you posted. ← David Rosen | Inequality: Trump’s Challenge, Trump’s Failure?